The women from the Afrika Strik project in Dianalund showed us the different products that they volunteerly knit and sew. They explained us that they meet once per month, share some coffee and pastries and knit together for a while. The products that they create are distributed to countries in Africa and Eastern Europe with charity purposes. They have showed us all the products they make. 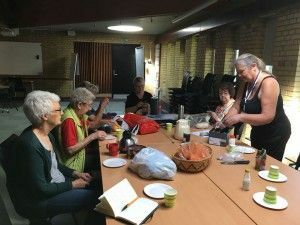 We thought that one of their meetings could take place in Sorø Kunstmuseum on the day of the PAIC's presentation, so that the visitors could participate in their act of knitting and also share some coffee and pastries with the women. In this way, conversations will emerge. Moreover, because the idea of Africa is an important reference for them, they proposed to make with textiles all together a map of Africa. In the sessions that have been taking place until now, we have been working together in the sewing and knitting of the parts of this map that will serve as part of the setting for the PAIC's presentation int he museum of art. They will also bring the products they make. On the other side, we have also been meeting a group of young adults in Sorø, who spontaneusly meet at Bo-og Støttecenter Sorø.We have mainly been working with the blind drawing technique to represent ourselves but also to draw some memories from the city that the girls shared with us in an urban drift. We have also visited the museum and we have been experimenting with sound by blind drawing our soundscapes. By doing this practices, we can share many personal memories that wouldn't otherwise emerge in the conversation. Anna Dot is an artist and researcher at the Department of Translation, Interpretation and Applied Languages of the University of Vic. Her projects focus on the processes of translation and communication, with special attention to the processes of reading and writing as well as digital technologies. In practice, she often uses tools which explore and which approach text as though it were a technology of accumulation. Her projects have been exhibited in Catalonian artistic venues such as Fundació Antoni Tàpies and La Capella (Barcelona); Bòlit Centre d'Art Contemporani(Girona); Museu de l'Art de la Pell (Vic);Capella de Sant Roc ( Valls). She has participated in Open Studio 2018 ( Madrid), and has exhibited in Plataforma Revolver (Portugal); Kunsthalle Mainz (Germany); Galería Tiro Al Blanco (Mexico) andMuzej savremene umetnosti Vojvodine ( Serbia).